So, where does this crisis end? We know where the leftists want it to end, with us silenced and subservient forever, toiling to pay taxes for them to redistribute to their clients as they pick at, poke at and torment us. You look at the things Trump stands for and all of them are about lifting the yoke off of us – cutting taxes, slashing regulations, guaranteeing the Second Amendment, protecting our religious liberty, and safeguarding us from terrorists and illegals. But everything liberals want, everything Hillary ran on, is about clamping the yoke ever tighter around our necks – raising taxes, issuing more regulations, disarming us, limiting our religious freedom, and putting us at risk from terrorists and alien criminals. The whole leftist platform is about putting us down and keeping us down. Think what they will do if they take power again. They are certainly not going to risk us ever being able to repeat November’s rejection. California’s decline lays out their tyrannical road map. When the Democrats took power here, they “reformed” the election laws to lock-in their party, co-opted the “nonpartisan” redistricting process, and changed the ballot initiative system to make sure we will never see another unapproved proposition. They ensured there is no way to stop illegal aliens from voting because they want illegal aliens voting. But even that’s not enough. The state government chose to allow its unofficial catspaws to intimidate and beat dissenters at UC Berkeley. California’s governing class wanted the thugs to prevail; it was a lesson to its opponents. I thought my novel People’s Republic, about post-freedom California, was an action thriller, not the first draft of a future history. Do you think Hillary Clinton or whatever aspiring Hugo Chavez they offer up next is going to protect us from violent leftist thugs, or encourage them? Remember how Obama weaponized agencies like the IRS against conservatives? Multiply that by a thousand. Think about the “hate speech” rules used to silence conservatives on campus; imagine them as federal law. That’s coming, just like in Europe – it’s now a crime in France to speak out against abortion. Do you imagine leftists don’t dream of doing that? No, once back in power they will ensure we will never be able to challenge their rule. One man (or woman or other), one vote, one more time, then never again. This massive resistance campaign against everything Donald Trump has done and a lot he hasn’t done is one way. The media’s liberal advocacy and tsunami of fake news is another; the press is now just one more partisan political player campaigning to restore the establishment to power. These same liars who fantasize about Trump silencing critics will cheer as the next Democrat commandante does it for real. Remember how they said nothing when Democrats voted to repeal the First Amendment so Congress could control speech during elections? And they think they’re winning. Sally Kohn, a CNN commentator perfectly personifies the left’s combination of utter cluelessness and utter certainty in its own moral superiority. 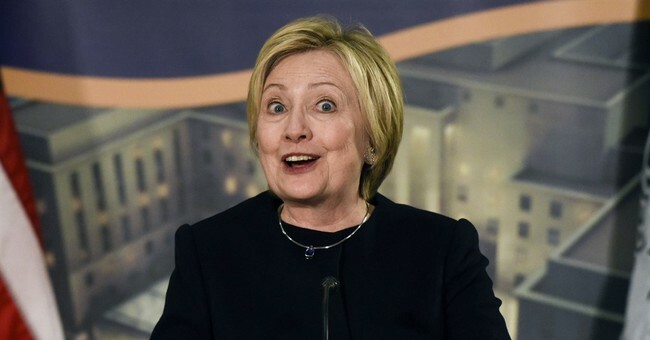 Drawing from her bottomless well of stupidity, she recently became infamous for wishcasting about what happens “[s]traight forward from here.” Her scenario starts with Step 1 (“Impeach Trump & Pence”) and ends with Step 6 (“President Hillary”), thanks to a Constitutional process she created herself by blending ignorance, fascism, and wanting. Sally, however, overlooked Step 2.5, where several dozen million Americans defend the Constitution by taking out their black rifles and saying, “Oh, hell no.” I assume the patriots determined to protect the Union would be confronted, for a short and awkward time, by a pro-coup hipster army locked and loaded with vinyl LPs, participation trophies and unearned self-regard. There’s no reason not to believe that for these seditious Democrats, the second time will be the charm. But this amusing idiocy highlights a much more frightening possibility. Dennis Prager has written that America is locked in a Second Civil War already, albeit a cold one. And in light of the absolute rejection by the left of any legitimacy of the grievances, the interests, or the right to participate in governing this country of the tens of millions of red Americans, it’s reasonable to wonder how this can end peacefully. You see read it on social media, you hear it whispered. Are the wounds to our body politic so deep they can’t be healed? I recently polled people on Twitter about what they thought of the chances of serious violence in the coming four years, and the results from 6,159 people are alarming. “Stop being a nut” got 10%; I was hoping it would get about 95%. “We’ll wise up” and find a way out of this crisis, got 13%. But “50/50 leftists may try violence” got a stunning 41%, while “It’s coming. Gear up” got a terrifying 36%. So, 77% of the respondents fear serious violence during Trump’s first term. That’s scary, especially since political warfare is not unprecedented in history. Forget Bleeding Kansas. Just reflect on the low-grade insurgency the American left undertook in the 1970s, with more bloodshed than most people remember, and consider how today the left has significantly more cultural, institutional and media support. The reality is that there is the potential for this to get out of control, way out of control, especially considering the likelihood that leftist violence would be met in kind. That 77% indicates that the red side is, as the left loves to say, “woke” to the threat. And the red people have the guns and training, should things degenerate into serious chaos. Basically, this country is a powder keg, and leftist fools who do not understand the danger are figuratively standing around it, firing up their bongs. Now, understand that leftist liars will meet this column with the slander that I (and by extension, you) hope for violence. Skim down the comments and check out the idiots no doubt infesting my Twitter feed – you’ll see plenty of such lies. Actually, this is yet another of my several pleas for sanity and peace (including in my book’s preface). But the left’s favorite tactic is to deny substantive truth in favor of narrative; what I (and you) actually believe is irrelevant. This infuriating tactic makes reasoned discussion and argument impossible anymore, which itself makes violence more likely since it forecloses the primary method of peacefully resolving disagreements. If you can’t argue, if you can’t even speak, there’s only one way to be heard. The left’s combination of evil and stupidity is the driver straightforward from here. With the grim understanding that they hate us, we need to accept that there may be no easy return to peaceful coexistence. Our goal in electing Donald Trump was to remove the left’s hand from our throat, not to put our hand around blue peoples’ collective windpipe. We don’t care how they live their lives, but leftists care very much how we live ours. Their goal is to lock both hands around our throat and squeeze until we submit to leftist tyranny or die. It’s hard to see how we compromise. Do we just somewhat submit, or only die a little? This crisis has to culminate somehow. It could end peacefully, with a return to the old norms and reasoned competition between ideas. But it seems no one is interested in that; instead, one side has to win decisively, and one side has to lose decisively. If so, I say we win and they lose, since I’m not ready to submit or to die.